This species occurs in Gunung (Mount) Brinchang Forest Reserve. Regional Environmental Awareness Cameron Highlands (R.E.A.C.H.) is an active NGO working within the area where this species is found (N. Ahmad pers. comm. January 2018). Control of the amount of tourists through enforcement by the Forestry Department of Pahang, and educational awareness of this species is needed to protect this species (Malaysia Red List Assessment Workshop January 2018). Studies on population size, distribution and trends, life history and ecology, and threats are needed. 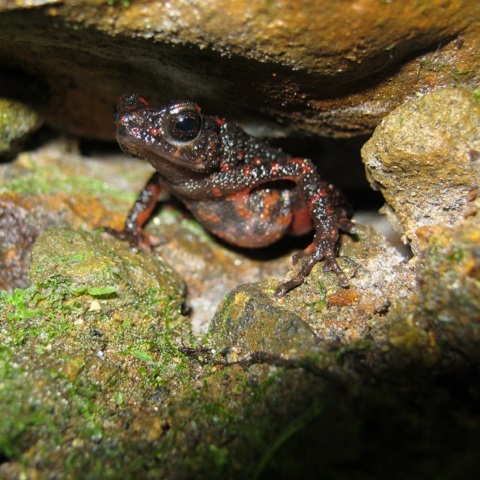 This species is known only from its type locality, around the top of Mount Brinchang (1,954–1,991 m asl) in the Cameron Highlands of Pahang state in Peninsular Malaysia (Matsui 2009). It is a microendemic to the mossy forests which are only found on the peak of the mountain and it is unlikely to occur more widely (K.O. Chan pers. comm. January 2018). The exact area of occupancy (AOO) of the species is not year clear, but its extent of occurrence (EOO) at present is unlikely to be more than 10 km2. This species is known from only one individual, so its population status is unknown. It is well camouflaged, very small in size and burrows into mosses which makes it difficult to find, and is often only detected by its call (Malaysia Red List Assessment Workshop January 2018). The Cameron Highlands are characterised by extensive tea plantations dating back to colonial times (Wonderful Malaysia). In addition, these highlands—and Mount Brinchang in particular—are a popular destination for tourism, therefore activities such as hiking and expanding tourist facilities are likely putting pressure on the species' habitat (Malaysia Red List Assessment Workshop January 2018). Furthermore, the illegal collection of slipper orchids from the mossy habitat of this species that is occurring on Mount Brinchang may also cause disturbance to this species (Malaysia Red List Assessment Workshop 2018).